Thanks to everyone for attending my session on SignalR. I talked about quite a few things in the session that I linked to below. If you’re looking for links to materials for SignalR, here they are! These days I’ve really latched onto using GitHub as the place to update these demos with new techniques and ideas. Combine that with continuous deployment and I hope to soon be able to provide people with working code and running samples. Also includes Windows 8 Store version to demonstrate cross-platform capabilities of SignalR as your backend. Demonstrates IHubContext so you can make calls to clients from outside a SignalR Hub. Demonstrates how you can avoid putting your business or simulation logic in SignalR Hubs. Demonstrates self-hosting SignalR in a Console app. Demonstrates cross-origin request support with the client web pages originating from a separate MVC project. 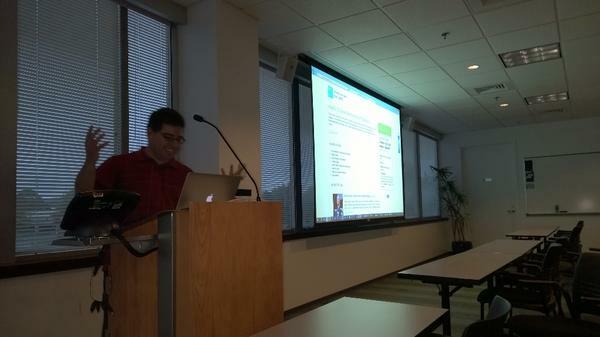 Thanks for attending Philly.Net’s 15 minutes of Fame with our fast paced topical talks in fifteen minutes each. I created a few videos that can help you get started with publishing games on Windows. I’m going to continue making videos and blogging about them. The videos are a way for you to see in bite-sized increments how to get started publishing games. First, I decided to use the Unity game engine (www.unity3d.com) because you can get started for free, and you can publish to the Windows Store, Windows Phone store, Android, and iOS right away. There’s no question the web site is a little misleading about this, so I will be making more videos where I introduce basic concepts but I’d also like to go through the last mile of platform specific content that will get your game approved. Thanks to everyone for attending my presentation about SignalR, OWIN, and the Real Time Web at First State .Net User Group. Forza 5 crashing – Should you go wireless? I had given up on Forza 5 and, truth be told, looked into returning my Xbox One. My retailer return period expires in a week or so, and I was kind of done with being the troubleshooter over this. To make a long story short, one of these people (@tiwahu on Twitter) thought there might be an issue with using the Wired connection on Xbox One with our crappy Verizon supplied Fios 10/100 routers. What is interesting about this is your natural inclination is “wired is better.” I was asked by support a few times if I was connected wired into the router, and asked to provide more details about that. They preferred wired. Who wouldn’t? The following is an email I sent to a support email and also posted on the Forza Motorsport forums. I needed to post it here because the folks at @XboxSupport have been the only ones to be truly responsive to my issues. However, I can not keep describing the whole issue 140 characters at a time since each new day I encounter a new person who needs me to start over with them. Anyone reading this for the first time, please review that thread and the youtube video I discuss. I have also extensively explained the issues in the linked forum posts. What is very clear is that every time I install the game, the install appears to not completely work and at least one track will never load for me (no matter the game type, car, or user profile). That track (so far it has been one per download but it doesn’t have to be. Other Forza Motorsport forum users report problems with more than one) will crash forever, on any race type, mode, or user profile until i delete and redownload the game. The problem is I can not get a clean download where I can prove every track works. Each time, it may be a different track that is corrupt. I still think it is possible for more than one to be corrupt. So far no one appears to be able to help me. I have had this problem since launch, although it took awhile to figure it out, and since Dec 8th I have been keeping meticulous notes about it. We are almost at a month since launch and it is getting really annoying when you think about the hard earned money you've spent on a console and a game and the vendor of that game will either censor or refuse to respond to your pleas to help them troubleshoot the game. Thanks to everyone who attended my talk about using SignalR “in the real world.” Besides being an introduction to SignalR for everyone who’s curious about this technology, we talked about some more advanced scenarios I have experience with, including using the IHubContext interface to broadcast from outside a SignalR Hub and the exciting “cross platform” scenario that is enabled by the several SignalR clients out there. I wanted to start getting all the code we looked at up on github. I will continue to update this post until all the samples we saw are ready for you to try. https://github.com/spaceshot/chatter – This is the repository holding the chat web app and windows store app. They should work together. I did develop these projects in Visual Studio 2013, which has built in Git support and it is a lot easier to clone the projects directly from GitHub and begin working. If you have a need for Visual Studio 2012 support, please let me know. Up next, I need to get the StockTicker sample (modifying an existing service) up and finally the “game board” sample where you could move game tokens around a sample grid. Coming soon are my tutorial writeups for those who didn’t make the code camp talk! This talk was about SignalR 1.1, but the foundation applies. About SignalR 2.0 and begins to explore performance and scalability. An on stage demonstration of building a SignalR-like framework. Great to understand how it works. So I got tripped up at Central Penn.NET’s Code Camp with SignalR 2.0. I realized there are a lot of blog posts that need to happen to explain some of the changes. One of the great things about NuGet and the building of a .NET ecosystem around NuGet packages is that installing components you want to make your application go has never been easier. It’s never been easier to stay up to date. It’s never been easier to adopt new versions. In my talk yesterday about using SignalR in the real world, I got tripped up when doing the Stock Ticker that updates as stock prices change. I know now that a breaking change in SignalR 2.0 obsoleted the common MVC era extension method for setup that many modules use. Many components add an extension method to allow you to add routes with simple syntax, but it becomes custom syntax. That does violate the spirit of OWIN a bit, and I think the SignalR team is definitely very supportive of OWIN. This also means we say goodbye to the Microsoft.AspNet.SignalR.Owin NuGet package since this implementation doesn’t need the setup being provided by that package anymore. More info on that in the SignalR faq. So for now, here is a link to download the completed Stock Ticker sample. I’m going to investigate now whether a different version of SignalR is automagically downloaded to you when you create your first SignalR Hub class via tooling or whether you go with NuGet. I know that you can install specific versions of packages using NuGet, but I think most people don’t do this when they hit File > New Project. It might be something I do from now on in presentations just to make sure something hasn’t changed, even in the last few days!